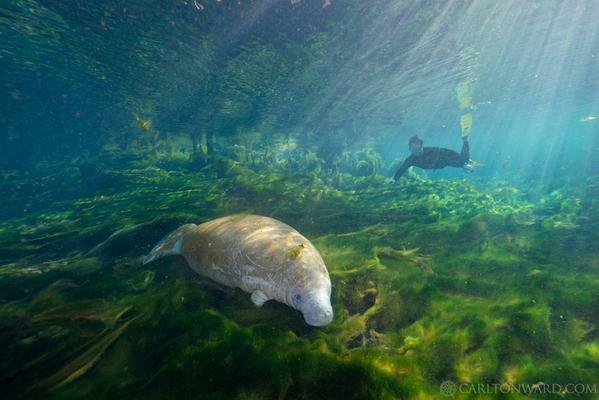 Expedition member Joe Guthrie dives into Manatee Springs, along with photographer Carlton Ward Jr. It's a chilly morning at Rainbow Springs. A vicious overnight storm cleared just hours before, and sunlight is dancing on clear waters tinged with azure. We begin our paddle at the spring head, a pool of blue that resembles what the noted conservationist Marjorie Stoneman Douglas once described as "bowls of liquid light." Water bubbles to the surface from a deep hole that dives into another world. Nearly half a million gallons of water flow from here every day - powerful enough that we don't even need to paddle to float downstream. I'm kayaking back up the Rainbow River with about 30 or 40 kayakers and canoeists. I just saw a cormorant drying his wings on a cypress tree, and a river otter scurrying by right in front of him. There are ibises out here, little blue herons, the water has a green tint here that's just beautiful - it reminds me of the Florida Keys. You can see the sea grasses , no problem. "Good morning, everyone. My name's Mallory Dimmitt, I'm the executive director of the Florida Wildlife Corridor, and I am so grateful for each of you hardy souls for coming out on what started out as a rainy and cold morning and making the drive and the effort to be here," she said welcoming the group to the public paddle, in Marion County. 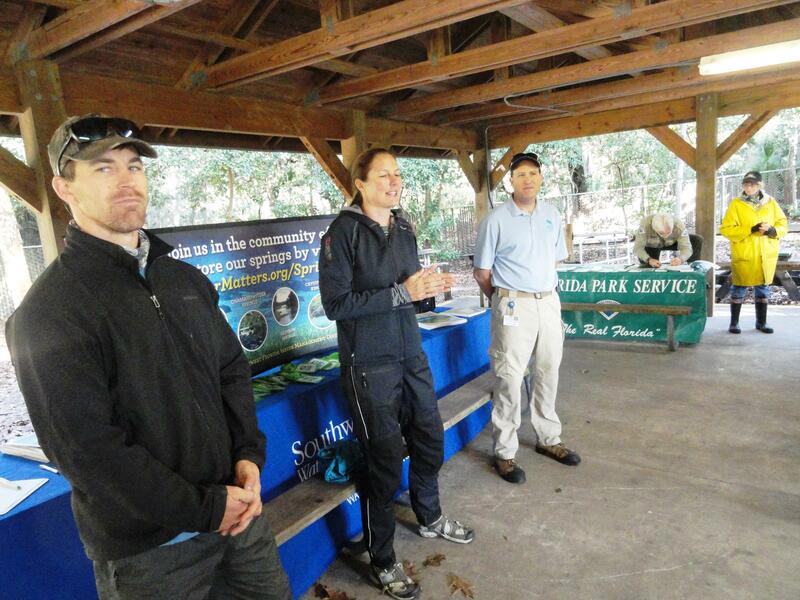 Expedition members Joe Guthrie, left, Mallory Lykes Dimmitt and Chris Anastasiou of the Southwest Florida Water Management District. Enroute to Rainbow Springs, Dimmitt and fellow expeditioners Joe Guthrie and Carlton Ward Jr. explored places like Homosassa Springs and Crystal River. "There's one moment when we were exploring the head springs at Chassahowitzka, when Joe went off in a different direction and he found an area where there were four shafts - or keyholes into the lime rock - separated by 10 or 15 yards, and he actually went down and showed how we're able to travel about 40 yards underwater, from one to the next to the next, and pop up quite a distance away," Ward said. When asked if he was claustrophobic, Guthrie replied, "No, I felt confident in there. It's not without - I mean people have got into trouble before. But in the springs, I just turn into a 12-year-old guy again. I'm just like - you know..."
Springs are probably the iconic image of Florida. They have fueled the imagination since the Fountain of Youth back in Ponce de Leon's days. Tales through the centuries abound of mermaids and manatees. William Bartram, who explored these backwoods and swamps before even the American Revolution, called them a "crystal flood," "almost as transparent as the air we breathe." "The blue ether of another world." 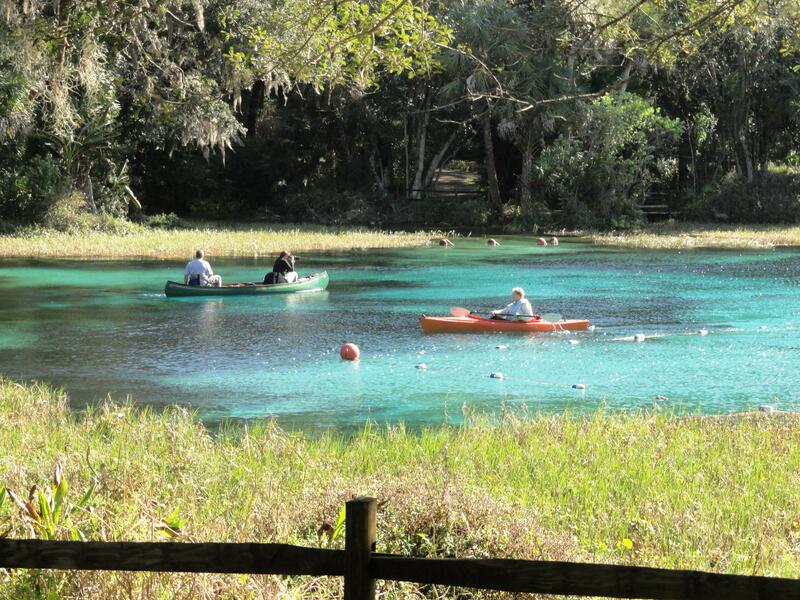 Rainbow Springs is so clear you can see down to 250 feet. "To give you an idea of what that means, pure water - like pure distilled water - runs to two hundred seventy feet. So we're getting close to actually very clear water conditions. It's a beautiful system, it's ours to protect and conserve, and that's what we're really all about in the upper portion of this river," says Chris Anastasiou, head of the Springs Team for the Southwest Florida Water Management District. "Rainbow Springs is truly a unique place," he says. "We're really blessed to have such a beautiful system. The upper portion of the Rainbow River is one of the most beautiful rivers you'll see anywhere in the state. It's one of the largest, and when you paddle down the upper portion of the river, the vegetation is beautiful, the clarity is beautiful." But - this is a tale of two rivers. That famed clarity gets a little cloudy as we paddle downstream. There's nutrients from runoff of lawns and septic tanks that begin lining the river just a couple of football fields downstream from the spring. The threats are multiple: hydrilla hitches rides on boat propellers. There's an outbreak of a blue-green algae called lyngbya. Anastasiou says once it gets a foothold in a spring here, it's hard to get rid of. "Now this river isn't without its issues," he says, "and most of these issues are focused on the lower portion of the river. Invasive species - that's a huge issue is most of our springs, irrespective of nutrients and flow. Invasive species - just like in the terrestrial world - once they get in, it's very hard to control them." Dimmitt says bringing the public's attention to the need to preserve these springs is one of the main reasons for the expedition. "We definitely did see algae everywhere you go, in all the springs, that is a concern," she says, "and so part of the reason for being at Rainbow Springs and all the events is to bring awareness to the need to protect the head springs, but also the watershed surrounding it, so we as a human population are working on controlling our nutrient pollution, so we can keep these crystal-clear gems clear into the future." Ward, a Tampa photographer, says the springs are getting a lot of attention lately - particularly with the passage of Amendment 1, which frees up money for what he hopes will be land conservation. "On a national level, people know about the Everglades. 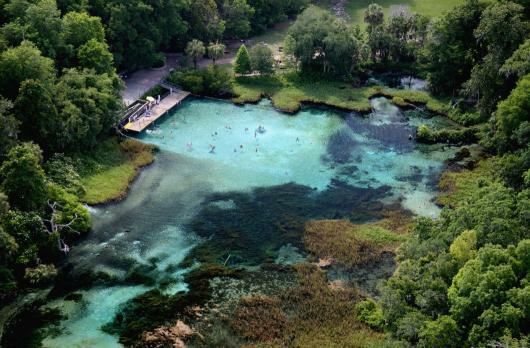 But they don't necessarily know that Florida has the highest concentration of freshwater springs in the world. And how absolutely amazing they are. And so the more we can tell that story, the better still," he says. For people like Anastasiou - who tells his two young daughters he goes to work with the mermaids and the manatees, there's still hope for the future. "I do think it's an iconic piece of Florida's culture. I do think the future is brighter than some may say. I am an optimist at heart, and I think that with public awareness and education comes restoration and protection of these spring systems," he says. " So I am optimistic." Hopefully, those "bowls of liquid light" will continue to shine in the future. This Saturday, the expedition will host a group hike on the St. Marks National Wildlife Refuge, south of Tallahassee, open to the public. 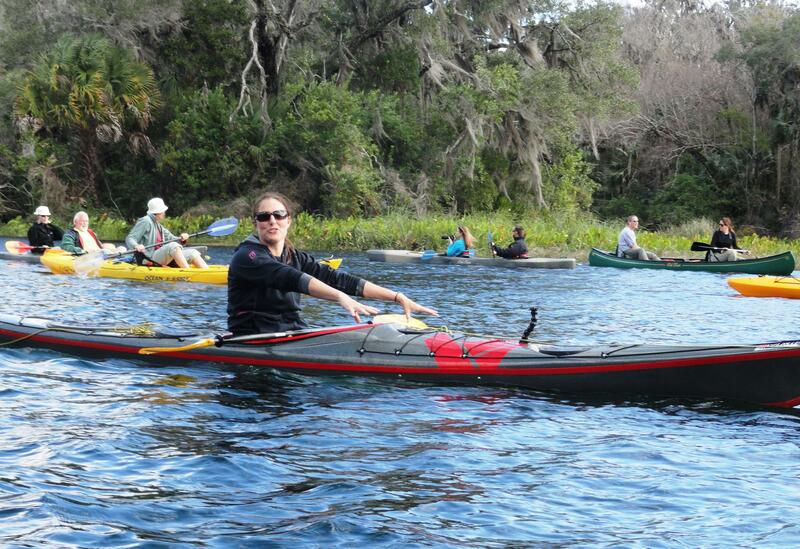 Three years ago, four conservationists embarked on a trip to walk and kayak the entire length of Florida. Their mission: to bring attention to the need to protect lands connecting the state's wild areas. Now, The Florida Wildlife Corridor Expedition is back - and it's taking a different turn. There's an old Chinese proverb that the journey of a thousand miles begins with one step. Well, they're not going a thousand miles - only 925 miles, give or take. And their first step was on a pedal. Of a bicycle. 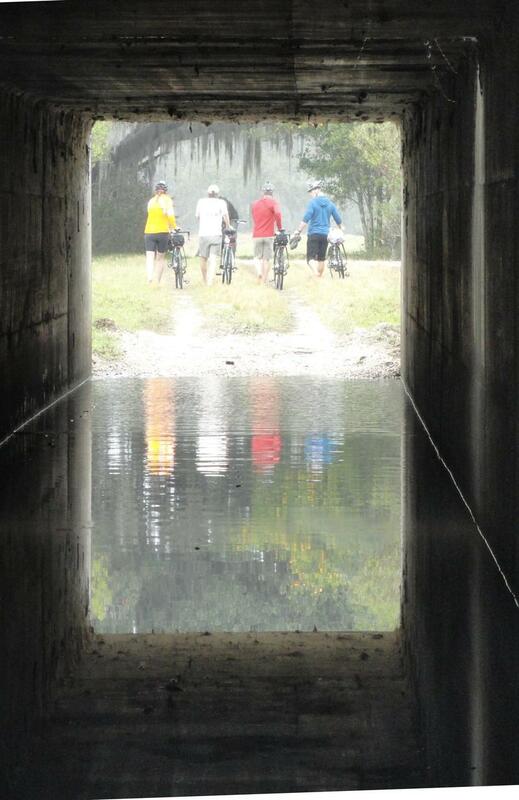 The members of the Florida Wildlife Corridor Expedition are off on an encore version of their epic thousand-mile journey in 2012. Then, they trekked from the tip of the Everglades through the remaining wild spaces of the peninsula, north to the Okefenokee Swamp in Georgia. Back in 2012, four explorers spent 100 days walking and kayaking 1,000 miles up the length of Florida, from the Everglades to the Okefenokee Swamp in Georgia. 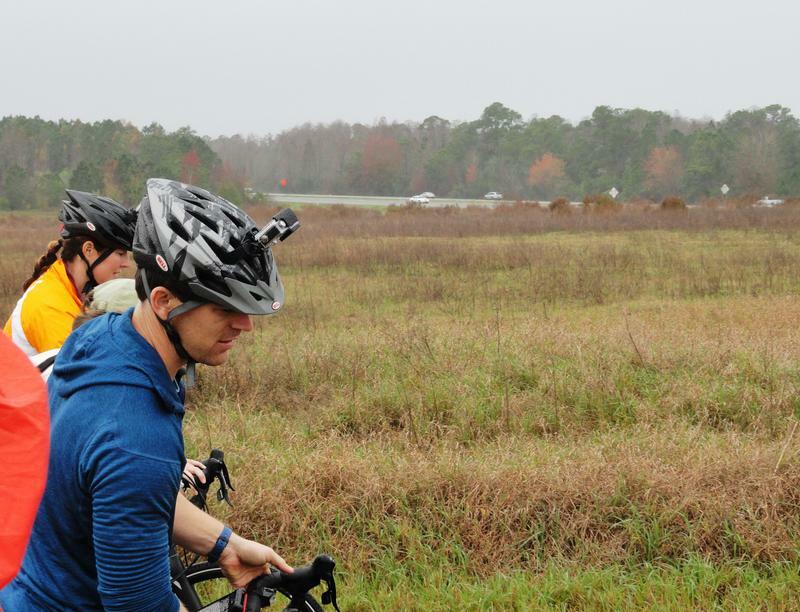 The mission – to publicize the need to connect the state’s remaining wild areas. This year, the Florida Wildlife Corridor Expedition is back.